I'll admit that I was one of those people who thought the Cartoon Network and Aaron McGruder were just playing with my emotions when they announced that there was going to be a season 4 of the hit series The Boondocks. I had pretty much given up hope that one of my all time favorite shows was ever going to return to the air, but it looks like I was wrong. The Cartoon Network recently announced that The Boondocks will be returning to the air on April 21st at 10:30 PM. I don't know about you, but this is some of the best news I've heard in a while. 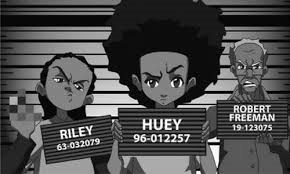 I can really use a little Huey Freeman in my life right now. I would love to hear what the 10 year old has to say about all this talk going on surrounding Richard Sherman. So are you excited about the return of The Boondocks?